1. Peel bananas and slice into thin rounds. Place in a large, shallow container, cover and freeze for 4 hours, or until solid. 2. Break the banana coins up and place in a food processor with the lemon juice and coconut cream. Blend on high speed for about 1 minute, stopping to scrape down the sides with spatula midway, or until the bananas have a uniformly creamy consistency. 3 Divide mixture among 6 x 1/3 cup (80 ml) capacity ice-block moulds and place a paddle pop stick in the centre. Freeze for four hours, or until solid. 4. 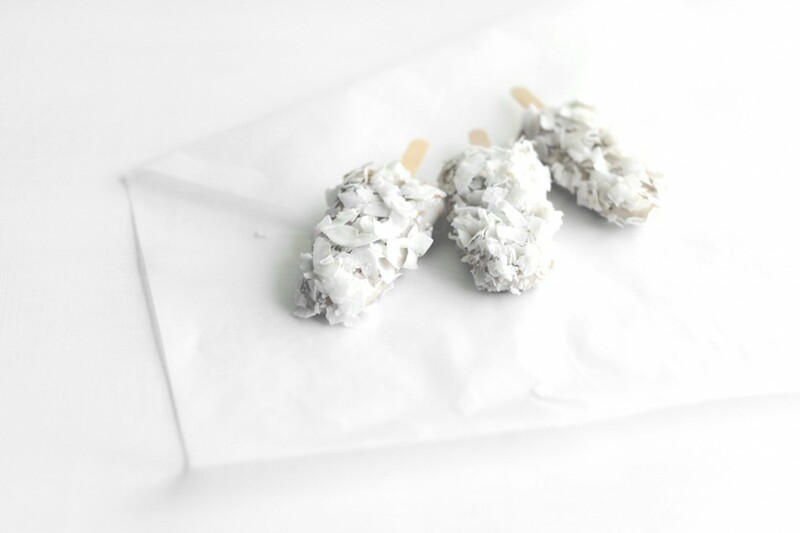 Place coconut flakes on a wide, flat plate and line a small tray with baking paper. Fill a bowl with hot water and dip the ice block moulds in for 4 seconds or so to melt the outside slightly. Gently press each of the ice blocks all over with coconut flakes and set on the prepared tray. Freeze for another half hour, or until set.